Haley Hilton is a journalist, dancer, and dance teacher from Salt Lake City, Utah. She has danced professionally with Odyssey Dance Theatre and has taught for four years at Center Stage Performing Arts Studio in Orem, Utah. She recently graduated in Journalism from Brigham Young University. Complexions Contemporary Ballet. Photo by Steven Trumon Gray, courtesy Complexions. Complexions Contemporary Ballet is celebrating their 25th anniversary this year, and we can hardly contain our excitement. Their longstanding commitment to diversity and daring, edgy repertoire has made them an exemplar of American contemporary ballet today. The company's season opener will be held at the Joyce Theater from February 19–March 3. Works include the world premiere of Complexions co-founder and choreographer Dwight Rhoden's WOKE; a compilation spanning 25 years of the company's repertory titled From Then to Now; the return of the David Bowie tribute Star Dust; and the New York City premiere of Bach 25. A gala evening will be held February 21, in which Complexions co-founder and co-artistic director Desmond Richardson will perform for the last time as a full-time company member. Pointe caught up with Rhoden and Richardson in separate interviews to hear them reflect on what the past 25 years has meant to them, what audiences can expect from their anniversary season, and why Richardson is choosing to step away from his role as full-time company member. What does this anniversary mean to you? Dwight Rhoden: It is a momentous occasion. I never thought that I would have a company for 25 years. Actually, I never thought I would have a company period. We started this out as a project in 1994, that would bring together 24 dancers from all around the city. Desmond and I were in Alvin Ailey American Dance Theater at the time, and it was through the advice of Mr. Ailey himself that we decided to collaborate with dancers from American Ballet Theatre, New York City Ballet, Joffrey and even some from downtown. It turned out to really resonate. There was a need for diversity, inclusion, a mix of dance forms, bodies and races. We have been doing that from the beginning. I don't know why it's taken so long for the rest of the dance world to catch up, but we are happy to be celebrating an anniversary that—and I say this with the most humility—changed the game. 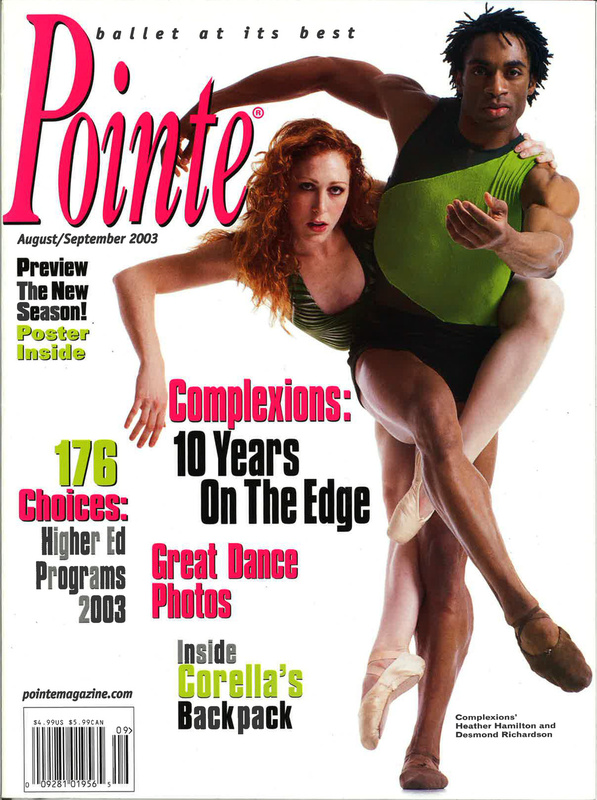 Richardson and former Complexions dancer Heather Hamilton on the August/September 2003 cover of Pointe. Photo by Eduardo Patino. Desmond, why have you chosen to stop performing as a full-time company member, and what will this final performance mean to you? Desmond Richardson: This performance is a culmination of the many years that I have been on the stage. I started my career at 18, now I'm turning 50, and the whole thing has been amazing. I have danced all over the world in the most amazing houses. I'm in good shape, I can do a jeté anytime I want to, but I want to be able to walk away on my own terms. The body says thank you, but while you can still do a few things, let's pay it forward. Alvin Ailey told me that I would know when it was time to say adieu, and start inspiring in another way. That has finally come to fruition for me. I will still do outside projects, but when it comes to Complexions, I want it to be about the company. I want to share what I have learned with dancers and teach the next generation. Complexions straddles both the ballet and contemporary/commercial worlds. How have you been able to do this successfully? Rhoden: That has always been the mantra of the company. That is what Complexions is: dancers who come from different places, backgrounds and training to create something electrifying. When you join the company, you know that you're going to be pushed outside of your comfort zone in one way or another. Our dancers with a more classical background will be challenged just as much as our dancers with a more commercial background. The inspiration they give one another is contagious. We encourage the company members to look at their fellow dancers as vessels to glean new strengths from in a professional way. Plus, it's fairly common for dancers to be training intensively in multiple genres anyway. They all want an edge. Complexions Contemporary Ballet's Larissa Gerszke. Photo by Steven Trumon Gray, Courtesy Complexions. Diversity has been a part of your mission from the very beginning. Tell us a little bit about that. Richardson: We like different body types. It isn't about being cookie cutter for us. While I love tradition and classicism, and I believe there is a valid place for cookie cutter dancers in the world, our contemporary, neoclassical style lends itself to matching the pulse of what's real today. We want our company to be representative of what the country looks like now. That means we think it's important that dance not only incorporates a range of ethnicities, but cultures, genres of music, and dance styles. We want audiences to be able to see themselves in the performers onstage. What are you most excited for audiences to see this season? Rhoden: I'm excited about the season in general. This group of dancers is super diverse, and they really represent what it is that Desmond and I have been doing here all these years. We are excited to present everything we have been working on. Including my latest work, WOKE, which is a physical reaction to the daily news. It's about awareness. It looks at social justice and all the different things we are dealing with in our changing world, from gun violence, to immigration, to LGBTQ rights, to women's rights. It doesn't make hard determinations on each subject, but it's a reaction to what we are dealing with. We caught up with five major competition stars to get the deets on what was on their wish lists this past December—and their responses were positively dancetastic. Check out what they're most excited about using in the new year to help further their resolutions, and get some inspiration on what to ask for at your next big celebration!